On Jan. 7, 1985, I visited Boston's Isabella Stewart Gardner Museum, five years before the quirky palazzo was looted of a dozen paintings, one of the great unsolved art thefts of modern history. Even intact, I found the place a "weird, debilitating collection of dark, gilt baroque pieces, artlessly assembled in dim corridors and mocked by bright flowers assembled in hideous inner courtyard like Sears Garden Center." A hard assessment, but I was 24. The young are often unkind. Later that year, on May 11, 1985, I picked up my first computer, a Kaypro 2X, serial number 273997. At 29 pounds, it was considered portable. That fall I lost my job at the Wheaton Daily Journal, fired for something I wrote about the Rev. Billy Graham, and on Nov. 26, I visited the unemployment office at 35 S. 19th Avenue in Maywood. There were 55 people in line in front of me when I arrived at 8:25 a.m., affording me plenty of time to look around. "Plastic chairs are burnt orange, olive green, mud brown and blue. Dark brown carpeting the color of yesterday's oatmeal, walls a whitish yellow beige, as if they had never been washed." Never went back, never collected a dime of unemployment. I know this because I wrote it down, in the 1985 Waterstone's Literary Diary that my parents brought back for me as a present on a trip to London. It was a lovely gift, a rich red cover, filled with diversions -- essays, a crossword puzzle, a quiz. Every day had a noteworthy literary event (June 13, "W.B. Yeats born County Dublin 1865.") Each week had its own two-page spread, with an illustration and a notable quote or work or author highlighted. So began a tradition that tomorrow enters its 30th year, and, perhaps after yesterday's post on this blog's six-month anniversary, in the mood to confess what may be an alarming habitualness on my part, I am unwrapping my 30th journal. I suppose, if a person has been doing something for nearly 30 years, he should pause once and reflect upon why he is doing it. Why fill these books? At the time, for convenience. Appointments, interviews, birthdays, due dates. If you don't write them down, you can forget your obligations, and leave people sitting in restaurants, gazing at the door. In the back is room for phone numbers and addresses, and looking over them is a reminder of just how long relationships last. Of the dozen names on the first page of that 1985 address page, five I'm still in touch with. One I married. Otherwise, you see people come and go -- in 2006, I put Barack Obama's cell phone number down, though I can't recall ever dialing it, and it's too late now. But scheduling and contact information is only a fraction of what's in them. Most of the writing is from the end of the day, the basic outlines of what happened. Again, why? That's easy. Because you forget everything. All the details of your life are not only lost after you die, but before, while you're still here. I knew this even as a child, growing up, and it bothered me. I remember sitting next to someone on a plane, having a conversation, then realizing I was never going to see that person again. So I jotted down my fellow passenger's name on a piece of paper — I might have the slip still, tucked in a box somewhere. Remembering seemed important, on its own merits. I think I became a writer because I didn't want to forget stuff. Keeping a journal is a kind of control over the passing of time, a way of dipping your hand into the racing torrent of your life, scooping out a dripping meager handful of details, and saving them in a jar. A journal is perfect for that. You put in what was important, what is interesting, what meant something, and you tuck it away where you know you can find it. In 1985, I worked for the newspaper in Wheaton, but I had already started writing for the Sun-Times, and Chicago magazine, and other publications. The book is filled with notes to call this or that person, and lists of story ideas. That fall, I wrote to the Waterstone's company in London and ordered the upcoming year's literary diary, and in the years to come doing so became a Christmas treat for me. Subsequent diaries varied, they were different, having been placed into the hands of various artists and design teams, and I loved tearing open the package to see what it looked like this year. Some I liked better than others. At first I would write to Waterstone's, and it was always a worry, whether the diary would arrive in time for the new year. But then, one year, running late, I phoned, and after that I always phoned. It was a thrill to dial their flagship store in London and place my order, very carefully, imagining myself eccentric and wealthy, indulging this extravagance, explaining my order to the somewhat surprised clerk, who found herself shipping a diary to America. For a few years, Waterstone's had a store, just off Michigan Avenue, and I remember it was somewhat of a let-down to just clomp over there and buy it. What fun is that? Scarcity and difficulty create value. Beginning with that 1986 diary, I filled in the events of the day in a tiny hand that I could never manage today. 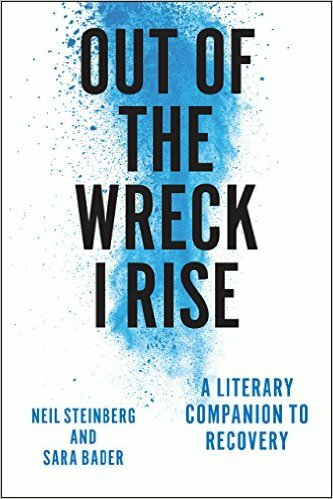 But that year, the tiny notions petered out on July 2, with a single sentence that explains why, "Hectic day trying to finish work & get ready for trip." A glance at the day before gives a sense of the freelancer scramble: "Busy workday worked at finishing up Sun-Times stories, Nostalgia stories, N.S. story, got call from WLS D.J. Larry Lujack for N.S. story. Talked to Newsweek first thing in morning about last 2 profiles. Dictated over phone, took three hours out at middle of the day and wasted it -- walked to library to mail N.S. article and book to Didi--$5 to mail a paperback to Haiti. Ate a slice of pizza, looked through bookstores, didn't get home until 2, missed surprise air express delivery of photos. Mad about that." "N.S." was "Northshore," a now-defunct magazine. I have no memory of ever talking to radio great Larry Lujack, who coincidentally died earlier this month, nor even what the story might have been about. That seems odd—you'd think a person would remember, but that's my point. The journals are rarely literary, in themselves, rarely structured prose designed to be read by others. They're bare facts, descriptions, impressions, salted away against forgetting and, I suppose, under the notion I might need them again. Sometimes I do. Sometimes I'm writing something and need to go back to a time; occasionally I find something useful, other times, just a blank. Sometimes I just pull one down idly to see what was going on. In 1987, I joined the staff of the Sun-Times, having freelanced for two years, and would make notes on stories, such as Friday, April 15, 1988. "Sent to the South Side, 48th St. and Wabash, for Ald. Dorothy Tillman's birthday celebration. After I got over my initial unease it was interesting to walk around the large hall & take everybody in. Many sharp sorts in small fedoras & 3 piece suits like cast members of 'Guys & Dolls.' Lot of commerce -- people selling Harold buttons, clocks, posters, records, a very thin poet was hawking his poem about Harold for $1-- the opening line was something like, 'He was the first & he was very very far from the worst.' ... Ald. Tim Evans spoke, not saying very much. He was a long way to go if he plans on filling Harold Washington's shoes." In 2001, Waterstone's shrank their diary to 2/3 the size it had been, and the next year it vanished altogether. It hurt, but I shifted to Brownline Daily Diaries. They're spare, they don't have the literary trappings that Waterstone's did, but do have a pleasing utilitarian office supply vibe. They're smaller, but give each day a full page, and I've been pretty good about writing the events of the day, some years more than others. I've noticed that this year, with the blog, the entries are more telegraphic. The books are lined up, 29 of them now, a better record than anything technological. The coincidence of my old Kaypro's purchase being recorded in that first 1985 diary would look cheesy in fiction, but it is true. The Kaypro is in the basement, wrapped in plastic, a future antique, and if I wanted to read anything on the big floppy disks it used, I'd have to haul it out, fire it up, find the disks, assuming I still have them, and maybe I could read them more likely I couldn't. Thirty years from now, who knows what kind of electronic devices we'll be using, or if these new systems will be compatible. We may be able to dip into the Cloud, or the Cloud could drift away. Who knows? But the journals will be as accessible as they are now, on a top shelf of my bookshelf, easily searchable, and if I want to wander off into the past, all I need to is pull one down. So what was New Year's Eve, 1993 like? Memory tells me a bit: no kids, newly married, living on Pine Grove Avenue and ... that's about it. The journal however, for Dec. 31: "Up at 5:11—began reading intro. Read & printed it & first two chapters. Slow going," that must have been Complete and Utter Failure, published in 1994. Then I moved away from work. "Edie up singing, getting ready for party." That should have been parties, plural. It was quite an evening -- going with old friends downtown to see Steve Martin's first play, then back to our place for Mexican food and drinks, then to a party Richard Roeper was throwing at Mother Hubbard's, smoking Cuban cigars and drinking whiskey with radio and TV personality Roe Conn. Sounds fun, and it is oddly comforting, looking at my sedentary, sober life now to remember that fun was had, and reading other entries is a reminder of how much fun wasn't had, the experiences as inevitable as stepping stones, leading to right now. Tonight, as usual, we'll be watching movies at home with the boys, drinking sherbert and ginger ale punch, eating little hot dogs wrapped in dough and shrimp. I can't honestly say that I'd rather celebrate New Year's Eve 1993 than New Year's 2013. A journal doesn't take that much time, and it is a statement that your life might be worth recalling. I can't pretend that anybody else would be interested in them -- heck, I'm hardly interested, and it's my life, and half the time, when I do look at them, I'm rewarded with some stark barb that's painful to recall. But that's useful too — it's wrong to laud the joys of your past and ignore the woes. Both are necessary in the forging of your spirit. Tonight is a time for introspection, balanced on a peak between two years, 2013 gasping out its last minutes, 2014 taking its first gulp of air and letting out a newborn cry. Life is a very long time, or can be, and most people will use their time well and use it poorly, switching off, in fits and starts. It's good to keep track of life, if you can, so that when it's past, you'll know what happened, sort of. Happy New Year. See you in 2014. The year is off-balance, out-of-whack. Not just this year. Every year. And I'm not referring to the crazy stuff that happens, the shoves and kicks and twists to reality that send us muttering along our way. I mean off balance as in number of days. The second half of the year, the six months of July, August, September, October, November and December, has 184 days, while the first half -- January, February, March, April, May and June--contains only 181. You'd think people would know that generally. I didn't; I just assumed a rough balance, maybe 182 in the first half, 183 in the second, with the leap year day added to February balancing it every four years. But no. And if you're wondering why I was counting the days, tomorrow marks the end of the first six months of the blog, and I was wondering how I am doing. The Blogger platform tosses you a bunch of statistics, but not a daily average. So I had to take the total page views —168,000 -- and divide by the number of days in six months -- 184 (well, 183, since Dec. 31 hasn't happened yet) -- to get my daily average of 918. That isn't good from a mass media perspective. Not good from a Drudge Report, straddle-the-earth-like-a-colossus point of view. But it seems pretty good to me, and given the complete obscurity of most blogs, can be considered adequate. Others seem impressed. My pal Vanessa Grail, who writes the Messy Nessy Chic blog in Paris, told me it took her a year to get 30,000 page views a month, and I had that going out of the gate in July. Though it pretty much stayed there, after a big dip, to about 22,000 a month in August and September, then back up to 31,000, 32,000 a month. Lower in December, to 28,000, still around a thousand a day. Not a lot of improvement. But a little. The biggest change I noticed is the average bottom has raised. It used to be, if things got quiet, I could have a day when only 400 people looked at the blog -- the high is around 2,000, which I've hit on a few busy days. Now the worst it ever gets is around 700. If the thing tops 1,000, as it usually does now, I feel I've done my job for the day. Of course those are numbers, and the fact that I'm pondering them at all shows a shift in attitude. Numbers are essentially meaningless when it comes to judging writing, or should be. Though I suppose it isn't any different than brooding over book sales. The number of views seems more a function of how vigorously I tweet each post, and who re-tweets it, than the content itself. The question I am more concerned with is: does writing every day lower the quality of my work? Am I burning out, running out of steam? I don't feel like I'm shoveling ill-considered garbage online just to have something to post, and nobody has yet complained about that -- perhaps I shouldn't give them the idea. But someone would. The online world is not known for its kindness, and I figure, were the blog some tossed-off, shoddy thing, trolls would be lining up to gleefully tell me. Maybe that's coming. Although, the big advantage of blogging, as a form of writing, is that it can be easily improved. While I try to let the posts be—there are other tasks to do—only fixing typos, sometimes I go back once or twice or six times, reread the thing and fiddle with it, or add an additional thought, such as this one, which came to me Monday over a breakfast of Earl Grey and homemade banana bread fresh from the oven. Sometimes, in lifting out a sentence to fling out on Twitter, I'll improve the sentence, then sharpen it here as well. Posts at the end of the day tend to be better, more polished, less buggy, than they were at midnight, when Blogger automatically posts them. Blogger lists your top posts, and it's an interesting motley of themes. The most popular post, chiding Chicago's most famous chef, "Time to Stick a Fork in Charlie Trotter," didn't create a stir when it was written at the end of August. Then he died Nov. 5 and search engines grabbed it, getting 2,000 hits that day, and now it has more than 4,500. Yet close behind, the second most popular post, "Some companies you can't forgive," is about the Caribou Coffee shop in Northbrook washing away a gay pride window painting, and the whole idea of boycotting companies. Why that one? No idea. Maybe because Dan Savage retweeted it to his 160,000 followers. That must be it. In close third there is a long post on visiting colleges -- I assume, since it touches on eight schools, that creates a large built-in audience. Some of the posts have surprisingly long tails. I wrote something in the middle of September, based on a single exclamation of my older son, "That's not tellable, mother." It seemed a small family vignette, something written more for my benefit than anybody else's. But it can get 20, 30 hits a day (it's had 33 today), months after it went up, and is one of my top 10 all time popular posts. People seem to like family vignettes -- "Burning down Nevada," a chapter in my unpublished family vacation book, is another favorite, in seventh place. I'm considering putting the whole book up this August, but can't decide if doing so will help it get printed eventually, or make that an even more distant possibility. A lot of this is mysterious to me. I don't know why 4 percent of my audience is in China -- I have to assume it's a random effect of hundreds of millions of Chinese searching stuff, and doesn't involve any actual readers. I wrote a post trying to flush them out. Nothing. In third place is Ukraine, with 3,700 or so hits -- again why? I assume Russian mobsters, looking for sites to hack. But maybe it's just some odd online echo. What else? The Sun-Times seems to have accepted the existence of the blog, the way a lion will allow a tiny bird to alight on its shoulder. The two still aren't officially connected, though of course on days when I have a column in the paper, I link to it here, and that both reduces the burden of generating content, and I assume drives readers toward the paper's web site, which might explain why it's tolerated by them. While a rare reader will occasionally object to the name, what notice it has gotten has been positive. There was a lively debate over "The Connoisseur Trap," my take on the Lyric Opera's production of "La Traviata," and I was flattered when Alex Ross, the music critic of the New Yorker, left a comment. It's nice when that happens, when someone significant, like the great Gene Weingarten, of the Washington Post, retweets something, or the blog gets mentioned on the Economist's Midwest bureau chief's web site. Another plus: I had an advertiser for the past two months, Eli's Cheesecake -- thank you Marc Schulman -- and plowed the bulk of what he paid back into promoting the blog, in the form of a Hatch Show Print poster, which is being produced in Nashville as we speak, and will be on the streets in Chicago, and on display here, in a few weeks. Writing this hasn't been a particular strain, more a quotidian obligation, like flossing. Although, unlike flossing, I manage to actually do it when I'm supposed to. That could be a new use for something like Facebook -- provide social pressure for small but necessary tasks. "Hey Bill, I see on Facebook that you haven't cleaned your gutters yet..." But I have never missed a day, so chalk one up for mulish consistency, if nothing else (and yes, the echo of Emerson's "foolish consistency" is intentional. We be lit'rary round these parts). The jumbo first half of Everygoddamnday.com's first year ends tomorrow. I plan to continue this for another six months, an easier task, since they second half is short three days, and then re-assess again. My goal for the next six months is to somehow double my daily average, from almost 1,000 to nearly 2,000. It's seems doable. I don't think a poster will do that, but maybe just mere persistence will count for something. It often does in life. The first half of the year, by the way, is three days shorter because it contains February, of course, with only 28 days, this year at least, as opposed to, oh, August in the second half, with its 31 days. We don't divide the year into halves, usually -- why would we? -- so one half being larger is not the sort of thing you'd notice. I think that's why I like writing this -- I often learn new stuff, and I hope you do too. But even though you stop by for your own purposes, or because you're a random passerby from China, I still appreciate it. Thank you for reading. News has a way of following a reporter. I scheduled my trip to Colorado to coincide with my younger son's Christmas vacation, never realizing that a historic shift is taking place here — this Wednesday, Jan. 1, Colorado will become the first state in the nation (well, a neck-and-neck tie for first with Washington State, which also legalizes pot on New Year's Day) and one of the rare places in the world where adults can freely purchase marijuana, no strings attached. You don't have to be sick. You don't need a prescription. You only need to be older than 21 and not spark up in public. We should have visited next week. Kidding. I'm not running out to get pot, because either I'd like it too much or too little and either way would be bad. But it is an interesting cultural moment to witness, even second hand (insert your pun here) in the local press. The newspapers, always champions of the status quo, are eagerly ballyhooing the aborning era of Colorado Rocky Mountain high. 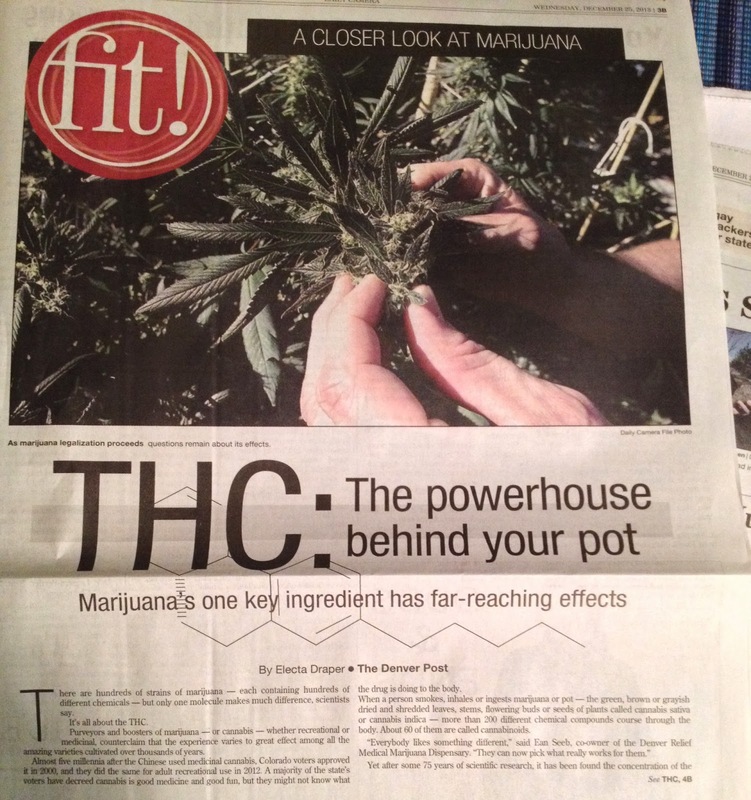 Saturday's Denver Post contained an extensive story on how to grow pot -- in the "Home" section, of course. Another showed up in the "Fit" section. Each adult can grow up to six plants, though the law requires that your stash be cultivated in an enclosed, locked space, which is just as well, as house pets carry parasites that can make your pot plants sick. Who knew? Sunday's Boulder Daily Camera was headlined "Waiting on Weed" and included the 14 stores expected to open for business New Year's Day -- none in Boulder or the surrounding Boulder County, whose licensing hoops will keep legal pot from being sold until February. "I have a feeling we'll be visiting a lot more often in the future," I deadpanned to my mother. Legalizing pot is a topic that encourages humor, both accidental and intentional. We went to see "Monty Python's Spamalot" at the Boulder Dinner Theatre Friday night—first rate singing, dancing and serving, by the way (the actors are the waiters)—and the obligatory insert-a-topical-local-reference-in-the-show segment of course referred to Colorado legalizing pot. "Not that anyone will notice a difference," quipped King Arthur, or words to that effect. No doubt. They legalized it here first for a reason. I suppose there are all sorts of somber, valid, good-public-policy reasons to be concerned, but at this point it just seems funny, to see society open its arms to what is basically a low-level, self-indulgent method to disengage your brain from the world for a while. Compared to the huge swath of death and destruction, illness and heartbreak carved by alcohol, I just can't see getting worked up at this point about sweet old Mary Jane demurely slipping her legal chains. Like gay marriage, the surprising thing will someday be that it was ever illegal. Another Post story on Saturday, by reporter John Ingold, was about the distribution of the first three dozen pot licenses Friday (about 100 stores are licensed in the state, so far) to vendors who already sell medical marijuana. When the first license was given out, "The handful of people in the licensing office -- some of whom had lined up as early as 7:15 a.m. to await the office's 8 a.m. opening -- applauded." When I read that, I smiled, considering it delightfully wry. As anyone knows who has ever covered stories involving people waiting in line — holiday shopping, or hot concert tickets, or those lining up to get the first picnic license — people show up hours, even days early for stuff they consider important. Showing up 45 minutes early is practically late, and struck me as a sly wink at the stoner culture to come, assuming it's not already here. I was wondering if he had written it intentionally. Ingold didn't answer* -- maybe because it's the weekend, maybe because most reporters don't leap to respond. Maybe he smelled a trap, and was worried about being accused of tucking double meanings into his staid news stories. He shouldn't worry; double meanings are inevitable. Another article — or his, they all blend together at this point — explained that distribution might be a problem, as the only legal chain of supply right now is for medical marijuana, and it'll take a while for them to ramp up the purely recreational supply chain. Shortages are possible. "Nobody knows how great the demand will be," I told my mother, as we sat in the Boulder Dushanbe Teahouse, waiting for our breakfast. "I'm sure it will be high," she said, her face placid with sincerity. I paused, looked at her for a lingering moment. I smiled. She smiled back. A beat. I couldn't say it. Sorry to take so long to respond. Regrettably, I wasn't trying to be wry with that sentence. Considering that there was no need to line up -- since store owners could pick up their licenses anytime during business hours on Friday (or Monday or Tuesday) -- I thought it was a sign of the store owners' enthusiasm surrounding the start of recreational sales that they would line up just to achieve some type of first. But if you found humor in it, all the better. I certainly don't take any offense to it. Whatever someone might think of our experiment with marijuana legalization, I think everyone can agree that it has been filled with plenty of little moments of absurdity. Near my parents' place in Boulder is an expanse of open space where I like to take walks when I can. The area is silly with prairie dogs, which are somehow less noxious than other rodents they are related to. Or maybe they're just less familiar, and in time I'd find them as odious as squirrels, if that is possible. Maybe more so — they're certainly louder. They hang out by their burrow entrances, like gang members on street corners. Whenever somebody approaches, they start squeaking out a warning, then zip into their burrows to safety. Researchers say that prairie dog warnings are one of the more complex communications in the animal kingdom, not only shouting "danger" but conveying details of what the danger is, such a hawk or a coyote or a person, down to specifics as to whether the person is thin or fat, even what color clothes the intruder is wearing. I was in the middle of the above reverie when I heard a bell. "On your left," a bicyclist said and I took a step rightward while he flew by, such a usual occurrence that it took me a second to make the connection between the prairie dog shrieks and the bicyclist's bell. Maybe I was selling my own species short — only a few days in Boulder and already I was glorifying any passing rodent while running down my own kind. Really, neither species' warnings are entirely altruistic -- the bicyclist doesn't want to hit me, it would wreck both his day and mine. And there is probably some Darwinian reason the dogs worry about each other -- safety in numbers, pack dynamics, they want the other prairie dogs to live and be around so the next hawk will get them instead. Or heck, maybe they love each other; heck you can't really ask them, though those researchers seem fairly confident about the specifics of what they're saying. And rather than skimp on warnings, when you think about it, human conversation, our media, is a chorus of cautions and clicks and whistles, clatter over new studies, debates over dangers. We don't consider it that way—it's usually either worrisome or annoying — but we show concern for the other members of our species by warning them about stuff, and we show concern for ourselves by paying attention to the latest news of possible threats. Probably too much. I don't speak prairie dog, but I'm fairly certain those alarms aren't warning about intruders who might be arriving in 2020. That can't be said for people. It is a gift from our enormous brains, the ability to fret over threats to come. But there's a limit, or should be, since at some point our worry risks becoming a greater peril than the peril we're worrying about. The prairie dogs only focus on the danger coming down the trail right now, and that is something we could learn from them. Otherwise, we ending up spending all our time ducking into our burrows, jabbering our hearts out, pointlessly, again and again and again. This is something new under the sun, I thought, gazing down at Sushi, the store dog at Wags on Willow, a pet emporium in the Willow Festival mall flanking the Whole Foods in Northbrook. It wasn't the sort of store I normally frequent. We have a dog, but are not constantly on the prowl for high end snacks and cable knit sweaters and the like. We feed Kitty — our dog — and keep her well-groomed and provided with snacks. Additional finery does not seem necessary. But we were killing time before picking up our youngest at his tennis lesson. I paused, gazing into a toy store, and my wife said, "We don't have little boys anymore," and then, perhaps to brush away the melancholy of that thought, added, as we passed the next shop, Wags, "...but we do have a dog." In the back, we met Sushi, a pug, obviously. The earrings caught my attention immediately. More than my attention, they caught my concern. Ribbons are one thing. This seemed ominous. I made my way to the counter. "Your pug," I ventured, gingerly. "Its ears...they're not pierced are they?" I asked of the owner. "No," said Mary Bowler. "They stick on. The groomer did it. They'll last until her next shampoo." Sushi is 14, and completely deaf, and also had a sparkly kind of applique stuck on her left hind quarter. Every dog owner is occasionally confronted by surprises, if not shocks, when a dog returns from the groomer — sometimes our dog, Kitty, looks like a collaborator who has been seized by a mob of fellow Parisians after the war and humiliated. Though, lest I seem to be slurring an entire industry, usually she looks just swell, sharp and trimmed and ready to sniff the other dogs on the street. And Sushi, who also sports a fine Burberry-like bow tie, seemed very content and well-tended for, ambling around the store, which featured an enormous oil of her mournful face behind the cash register. So this is not to take anything away from Mary, who seemed very nice, nor the store, which we plan to return to, with Kitty, to try on collars and see how they look. That said, for the record, I am not a fan of affixing things to your pets. Though the earrings are really no different than the pink ribbons Kitty sometimes come home with. While the ribbons give her a slight air of indignity, they also have a sweet, feminine quality, and I'm slightly sorry, a day or two later when they fall off, though not sorry enough to put them back on. For months, whenever the train would pull into the Metra station at the Glen, going north, I would look out the window and see that red van, filled with stuff. "There has to be a story here," I thought. There was. If you take the Metra Milwaukee North line, you might notice it, eventually. A red van, a 1999 Dodge conversion van, parked at the Glen of North Glenview station, in a corner of the parking lot by the Prairie concrete silos. It is always there, weekday or weekend, rain or shine. A few bikes covered with a blue tarp hooked on back. Snow piled on the roof in winter; in summer, folding chairs set out front. The windows are filled with stuff. Somebody seems to be living there. For the past year, Mark T. Johnson has made that van his full-time home. And if you are wondering how that can happen in a well-off suburb like Glenview, well, therein lies a tale. "I didn't want to be out in the rain, so I came inside," said Johnson, 59, sitting in the deserted Glen of North Glenview train station late one wet Saturday afternoon, watching cable TV on a system he'd rigged. He spends most of his day here or over in the Glenview Public Library. Many people do wonder about the van. "I been there long enough, the majority of people notice it since it's in the same spot," Johnson said. Few say anything to him, though. "Not to me, directly, but the woman who runs Lucy's cafe, sometimes people say things to her, and she repeats them to me," Johnson said. Pam Counihan works the morning shift at Lucy's, the coffee stand in the station. She used to give Johnson coffee and food, but commuters complained — he doesn't bathe as much as is ideal, living in a van. The police spoke to him. Now, he stays away from the station during morning rush hour. "He really doesn't bother anybody," Counihan said. "He's just homeless." Johnson does not smoke or drink, having stopped in his early 30s. "I just lost the urge," he said. He has no criminal record. And if you're wondering how Johnson is allowed to live at the train station, his answer is surprising. "I went to the police department and got permission," he said. Which is close to, but not exactly, the truth. The truth is even more surprising. The police version is not that Johnson went to them, but that they went to him. His living in the parking lot of the Glen of North Glenview was their idea or, rather, the idea of Stefan Johnson, deputy chief of the Glenview Police Department. "He's a longtime Glenview resident; he lived in our trailer park," Stefan Johnson said. "He's homeless. When he lost his home, he was living in his van for a few years, trying to get back on his feet, but he wasn't going about it in the right way." Mark Johnson would move the van to different locations around Glenview and live on residential streets, or try to. There, he was really noticed. "If you came out of your house to take little Timmy to school and that van was parked in front of the house . . . well, a lot of citizens wanted to run him out of town for parking on their little private streets," Stefan Johnson said. "It isn't illegal." The solution, in the deputy chief's eyes, was clear. "After a few months of complaints, I went to see if I could tuck him away," he said. The deputy chief settled on the parking lot by the Metra station. "That seems to be the place. I thought it would be a good idea. He's down on his luck, living in neighborhoods in Glenview. People were starting to get their hair raised. I went over and sat and talked to him, to see what we could do to help him out. I said, 'Hey, people are scared of you. Why don't you park here?' "
Mark Johnson was born in Chicago, grew up in Lake Zurich, then moved with his family to Connecticut. He always worked, driving for a bus company in Glenview, 10 years for a truck company in Wood Dale. "I jumped from place to place," he said. He stopped working in February 2006 after a spat with a supervisor. "I left in very bad standing," he said. "I did something." In essence, a supervisor yelled at him for using a washroom on company time. "So I started doing it outside," he said. Make no mistake: Johnson is a man who can be . . . flinty. "He has his ups and downs," Counihan agreed. "How would you be if you slept in a van in the dead of winter?" He certainly has his pride. Offer him money, and he will refuse. Ask if he needs anything, and he says no. He has a brother in Homewood, and his elderly mother lives in Glenview. But they are estranged. The true mystery, of course, is why the police didn't just find a law and put him in jail. That's what most departments would do. But if you talk to the homeless man and to the deputy chief, you soon realize that they have more in common than a last name. Living in a van, Johnson feels the weight of contempt from his fellow suburbanites. "They think I'm diseased or something," he said. And Deputy Chief Johnson . . . at first, he doesn't want to talk about himself. "Let's talk about Mark," he said with a laugh. But in time it comes out: born on the South Side, into a politically active family with ties to the Nation of Islam; the first African American on the Glenview force, 25 years ago, at a time when African Americans in Glenview were about as rare as homeless people. Let's just say it did not make him into a zealous enforcer of the collective suburban imperative to enjoy a world completely scrubbed of the Mark Johnsons of life. Glenview residents "just wanted the guy arrested," the deputy chief said. "They just didn't see his side of things. They wonder why he gets to park there. They won't see the big picture." "He has just as much right to be here as anyone else," Stefan Johnson said. "I've always been fair, rich or poor, black or white, everybody gets the same shake with me." Asked what other village officials he consulted with on this — the chief? the mayor? — Stefan Johnson said, "This is all me." Then, Deputy Chief Johnson did something that really surprised me: He asked that I not write about Mark Johnson because either Glenview residents would show up with torches and demand he be run off the parking lot where he has found refuge for the past year, or more homeless people would arrive, seeking refuge. "I'm going to try to talk you out of that story," he said. "I'm just trying to be decent toward him." So I did something that surprised me: I didn't write anything. I held off for three months while I tried, in a desultory way, to find something for Mark Johnson to do. Newsflash: It's hard to find someone who will welcome a homeless man, even one with a valid commercial driver's license. Even people in the help-the-homeless business. Organizations like CARA train people for work, but you need to have an actual address. They'd help him find a shelter, but Mark Johnson doesn't want to live in a shelter. He has a home: his van. He tries to think of his life as camping. He likes camping. His said his dream was to go work in Baraboo, Wis., because he used to enjoy going camping there. So I phoned the mayor of Baraboo, who listened sympathetically but did nothing. Phoned him a few times. And wrote. Nothing. Can't say I blame him. A tough task to help anyone, and Mark Johnson perhaps tougher than most. "He likes being independent," Deputy Chief Johnson said. "I tell him, hey, we can get him into such and such a program. He tells me, 'Hey, I've done what I can. I'm just in a bad situation.' I've set him up for interviews, but some part of him just turns people away." But not the Glenview police force, which keeps an eye on him. "Everybody knows him, most of the cops," the deputy chief said. "We act as an intermediary between him and the town. We take him food or clothes or money." What's next? I decided to print this because I realized that avoiding the risk of driving him away would just be assuming responsibility for his staying, and I wasn't comfortable with that either. "I know he can't be there forever," Deputy Chief Johnson said. "He's just a guy down on his luck. Maybe he's better left alone. I hope he can get a streak of luck. What's he's doing is not illegal. I'm sure that if he had a chance he wouldn't want to live that way." So what kind of story is this? A Christmas miracle, where somebody reads this and finds a place for Mark Johnson that isn't a train station parking lot? A Christmas outrage, where the good citizens of Glenview band together to eject the homeless man in their midst? I don't know; the ending hasn't happened yet. This Christmas I'm in Colorado, visiting my folks. But for many years, I signed up for Christmas duty at the newspaper, which gave me lots of time to muse on the meaning of Christmas. I feel like I came close to the mark in this column, which ran in the Chicago Sun-Times on Christmas Day, 2005. Or at least as close as someone who has never himself celebrated the holiday can. The piece has all those subheads because, back then, the column ran over a thousand words, filling a page. It might be a steep hill to climb in these days of 140-character tweets, but I hope it's worth it and adds to your holiday festivity, or comforts your lack of same. Merry Christmas. Well that's just dandy. Talk about delicious irony. The office empties out, everybody gets the day off, and they leave behind the Jew to explain the true meaning of Christmas. If I must. OK. Here goes. Ahem. Christmas. Dec. 25. There's this tree. . . no wait. This couple, Mary and Joseph, 2,000 years ago, and they have a baby and they name him Jesus and. . . Santa Claus, one night a year, hoists his pack. . . .
Oh, heck. Who reads newspapers on Christmas anyway? Only two kinds of people: those working and those visiting relatives. Because if you are neither, if you are off work and at your own home with your own family -- like most, in other words -- then by the time you get done wrapping the presents and videotaping the kiddies ripping open the presents, after you get dinner in the oven and scrub the toilets and straighten out the house for the 20 mooches arriving any second, there isn't a whole lot of time to sift through the newspaper, no matter how well-wrought and fascinating it may be. Being at the office -- or factory or doughnut shop -- can be tough on Christmas, not because there's much to do, but because it's a sign of just how far down the greased pole you really are. Everybody's off, but not you, oh, no, poor you, poor lonely you, forced to stay after school and clap erasers while everyone else is having fun. A blow to our fragile egos. Or so I imagine. I wouldn't know because I always volunteer to work Christmas -- to serve on the Jew Crew that every 24-hour operation puts in place to hold down the fort while the goyim relax. In a way, all those hatemongers sieg-heiling each other in their basements in Cicero are right: The Jews really are running the world, but only on this one day. Christmas Day is quiet, unless something burns down -- but it isn't that cold this year, so odds are that shouldn't be a problem. In earlier, more ambitious years, I'd try to find an interesting story to report on Christmas. A few decades back -- 1986, good God! -- I spent Christmas Eve riding on patrol with two Chicago Police officers. Tom Eich, badge No. 17815, and David Baez, badge No. 17696, in the gritty Wentworth District. I was scared witless and I was with two cops. Watching them work -- Christmas is busy in their business -- gave me vast respect for the job police do and how well they do it. The squad car was chasing some kids who stripped a car and, bouncing through an alley, came upon a loitering group of teens. Baez went up, spoke to them, placing a friendly hand on one kid's back. He came back. "It wasn't them," he said. "How did you know?" I asked, incredulous that he would just take their word for it. "When I put my hand on his back, I felt his heart. If he had run from where that car was, it would be going like a trip-hammer." Back to Christmas. If you are working, remember that the Norman Rockwell family Christmas you are beating yourself up about missing might not be the actual Christmas unfolding back home. While you are envying them, they might be envying you. Maybe you're lucky to be the one sitting in the computer room, under the harsh white fluorescents, dully flipping through the newspaper. Maybe the celebration has broken down -- as it often does -- into one of those memorable pit-of-the-stomach disasters that seem to afflict families every other year. Maybe you should be glad to be sitting at work, picking at a wilting deli tray, staring at that Halon emergency fire suppression cord again, the same chain you've been gazing at for 10 years while the conviction slowly builds that, one fine day, you will have to pull it or risk going mad. The other group of avid Christmas newspaper readers are visitors in other people's homes, the petrified living rooms of aged relatives, their furniture the latest style in 1971. You examine crass bric-a-brac, framed photos of happier times, plunk a key on the untuned piano, offer help in the kitchen, pick listlessly at the bowl of mixed nuts. To find a newspaper in such surroundings is manna from heaven, and the stories inside are fallen upon hungrily, even those endless thumb-twiddlers about Sudan. So I view my audience as two groups -- a guy at a security desk in a chilly warehouse, and an out-of-town uncle perched on an old sofa in a too-warm living room, trying to block out "A SpongeBob Christmas" blasting from the TV. THE MEANING OF CHRISTMAS IS . . .
For society, Christmas is shopping and gifts and commerce, the tail that wags the dog, and you don't need me to tell you how hollow that feels, especially as the sun begins to go down. Great that the economy gets a boost, but that can't be what it's all about. For the faithful, of course, Christmas is about Jesus, the Christ child, sent to Earth as the savior of mankind. Like all beliefs, it's great if you have it and a bit puzzling if you don't. Myself, I've always felt sympathy for Jesus -- I view him as another Jewish boy manhandled by religion. Poor fellow gets crowded out by the hoopla and ignored, year after year. Is there still more to Christmas? Are gifts why families get together this time of year? Is Jesus why they get on airplanes? Or is Christmas like Halloween, another pagan ritual jammed uncomfortably into modern clothes? Myself, I like to think that Christmas means we can beat back the cold with our warmth, the loneliness with our love. The most dysfunctional, broken clans still reassemble to give being a family one more try. The worst bosses still have devoted employees who turn their backs on hearth and home to play nursemaid to a balky network server on Christmas Day. Life is not fair, thank God, because none of us would want to get what we deserve. That's what Christmas is to me -- shorn of commerce and of faith -- it's a midwinter bonus, undeserved yet there, proof that we can take our drab, cold, silent, dark, lonely world and spruce it up, with lights and glitter and music and parties and friends and family and faith. But heck, I'm Jewish. What do I know about Christmas? This is a season of warm holiday fiction, from Dicken's A Christmas Carol to "It's a Wonderful Life." Something about the holidays makes us yearn for tales of grace and transcendence, breakthrough and redemption, and since it so seldom happens in real life, we have to make it up. But sometimes it does happen in real life. Most heartwarming Christmas stories are too good to be true, but get repeated because they feed that part of human nature desperately wishing they were true. But some stores are both good and true, despite being wonderful. The Christmas Truce of 1914 is one of those. It was 99 years ago tonight, in the world's first war -- they called it "The Great War" while it was going on, not knowing it would lead directly to a second. It had started in August, and by Dec. 24, 1914, a million men had already died. The German and British armies faced each other across the Western Front. After night fell, the Germans set up Christmas trees and candles atop their trenches; the Allied soldiers could hear them singing. "It was a beautiful moonlit night," remembered Pvt. Albert Moren of the Second Queens Regiment, who was stationed near the village of La Chapelle d'Armentieres in Northern France. "Frost on the ground, white almost everywhere. About seven or eight in the evening there was a lot of commotion in the German trenches and there were these lights —I don't know what they were. And then they sang 'Silent Night' -- 'Stille Nacht.' I shall never forget it, it was one of the highlights of my life. I thought, 'what a beautiful tune.'" It hadn't come out of nowhere -- the trenches were 50 yards apart. Groups of soldiers had previously conversed, played music for each other. And the idea had been floated by Pope Benedict XV, who suggested a break in the fighting for Christmas. That's what Christmas is supposed to do -- inspire us to pause from the daily battle, to reach for the life and beauty that is waiting there, whether in music and peace, or faith and festivity. Christmas is the only religious holiday that is observed by the United States federal government. Mail stops, offices and businesses close, even FedEx doesn't deliver. An economy that prides itself on selling you stuff whenever you want to buy it -- 24 hours a day, 7 days a week online, and close to that in the steel-and-flesh world, pauses to take a breath. It's a good idea even if you hold the faith lightly, if at all. On Dec. 24, the day starts out normally, often with work and the office, stores and shopping. Then as the day progresses things ... just ... slow ... down. The world seems to empty out. People exchange their wishes in offices that are half empty anyway, make a last, half-hearted stab at reaching people who left work hours ago, then go home themselves. Then things really quiet down, and in that hush, you can hear what normally gets drowned out, you can see the human spirit that gets lost in the cannonade of daily life. You can reach toward something beyond yourself. The Christmas Truce ended Dec. 26, the war started up again, and lasted nearly four more years, taking millions more lives. It was an extraordinary occurrence, and makes you wonder: if the Germans and the British could do it, then, why can't we now? What did Tommy and Fritz know in 1914 that Democrats and Republicans can't figure out today? Why the peace that can come on Christmas, then and now, can't last throughout the year is a worthy thought to ponder as we savor the warmth and plenty of our homes, our families and our precious lives. sort of a strange column. It definitely scratched an itch I had when I wrote it. I don't know if it's going to make anyone else feel better, probably just puzzle people. But it made me feel better, and sometimes that's enough. The snow was light and fluffy, and no sooner did I think, It’s going to be a white Christmas for once, then it began to rain, a cold, in-your-face sort of rain, beginning to wash the snow away, melting pristine mounds of smooth white into shrunken, spiky reefs of grime and garbage. Merry Christmas. Maybe next year. Christmas. A jewel with many facets: celebration, family, faith, community, lights, food, booze. And to each facet, a flip side: sorrow, rancor, doubt, loneliness, darkness, excess. They teeter-totter back and forth. Sometimes the good is up, sometimes it’s down. Here’s hoping, this Christmas, that your balance tips the right way — not a random process, I might add. Whoever you are, however tightly fate has got you, you still have a say in your holiday. Reach for the good side of Christmas, grab and raise it up. Merry Christmas. I saw a guy walking up Orleans with a button that read, “It’s okay to say ‘Merry Christmas.’ ’’ I almost tapped him on the shoulder and snarled, “Well then why not just say it, if it’s OK, instead of making such a big deal out of it?” By the time Fox News is done with “Merry Christmas” the phrase will have the sting of “sieg heil.” Be self-absorbed and joyless the rest of the year; if you want to celebrate your holiday, celebrate it. To apologize is to suggest that anybody expects apology. Nobody does. We just live here too, if that's OK with you and even if not. Display the respect you expect. Merry Christmas. A time when you give things, and get things, and that can be tough, because, as anyone who has ever opened a gift knows, you don't always get what you hoped for. "Always?" Try "often." Sometimes you do, with cries of delight, "Oh mom, that's just what I want." And sometimes you just cry, holding up the lumpy cable knit sweater. "Aww gee." You don't need me to tell you which group is better to be in. Sometimes not getting what you want leads to what I call "Nineveh moments." If you remember your Bible, the Lord tells Jonah to go to Nineveh and preach. But Jonah doesn't want that. Who can blame him? He wants to go anywhere else. So he flees. But you can't always flee fate, try though you might. Some presents you can't return. Some you have to live with. Some you learn to like. Satisfaction runs smooth, from hope to reality, like an icy toboggan slide. One moment you're on top, excited, then whoosh, you're there, just what you wanted. Disappointment jars but can be a gift, too, because it forces you to re-examine your desires. Now what? People remember the whale in the story of Jonah; they forget that, once Jonah finally gets to Nineveh, it all works out. So if this Christmas isn't unfolding the way you'd like, if the gifts aren't what you expected, maybe rather than complaining, you should just go to Nineveh. Go, see. Merry Christmas. Sometimes it seems that the focus is too much on the getting, and not enough on the wanting. Because both are adjustable. Here the Buddhists have it right. Don't try to be satisfied by making sure you always get exactly what you want. Disappointment awaits you there, because there is always another hill. You get This, and even while unwrapping it, you notice That, on the horizon. And off you go. Better to be satisfied by wanting what you get, even the times when it is very different than what you thought Santa was bringing. Merry Christmas. I'm off until after New Year's—if I don't say it, readers assume I've been fired. Nope, just home to Colorado to visit my parents, who are doing fine but like to set eyes upon their boy from time to time. That's a gift. As are my own boys, and my wife and our dog. You can focus on what you don't have, or on what you've got, and most people, if they do, realize they've got a lot. Merry Christmas. The rain tapered off and the snow returned. It looks like it will be a white Christmas after all. A reminder that, if you're patient, sometimes, when it seems like the world isn't going your way, it really is, you just don't know it yet. People pause this time of year and take stock, asking, "Is this the Christmas I deserve?" Whether you are celebrating in Cook County Jail or in a mansion in Kenilworth, the happiness or the sadness is still all in your head, and you have valid reasons to listen to either. Take my advice: Choose to be happy. Go to Nineveh. If you don't get what you want, you can shake your fist at the world and point tearily at the others, who got what they wanted. Or you can look at what you did get—a rather nice sweater, actually—and decide that maybe this is what you want after all. It might as well be, because it's what you've got. Merry Christmas. See you in 2014. The problem with the fixations of obsessives is that they become tedious to the unobsessed. But inside every idiotic flap, there is an interesting cultural discussion, crying to be let out. So before we let the Fox News "Santa-is-white" kerfuffle, which I waded into last week, fade into the oblivion it richly deserves, let us pause to consider the whole notion of cultural icons. Not just Santa and Jesus — who Fox also whitewashed — but all the rest, from Uncle Sam to Smokey the Bear. Some symbols were once real -- Honest Abe Lincoln -- others only notionally — Benny the Bull — while some fall in between. Icons do ... what? Entertain us, sell us stuff, comfort us. We rally round them -- that's their use in sports -- they unite us, represent us, are something we all agree upon. Or did. You're supposed to agree. But in a culture when agreement is in short supply, and disagreement is more the norm, our common symbols become problematic. Some people cling to them. Some attack them. I'm in between. I feel their attraction as strongly as anybody. I hated when the Big Boy chain of hamburger joints squeezed out their iconic Big Boy mascot. What was the point without him? It was just another crappy burger chain then, Denny's without the charm. I was relieved when the Boy returned, so much so that I actually patronized Big Boy restaurants, several times, with my family and friends, before we were forcefully reminded just how lousy the food and the service were. I grew up in Cleveland, was a passionate Indians fan in childhood, and a long-distance fan for the rest of my life. I cried when they won the pennant in 1995. 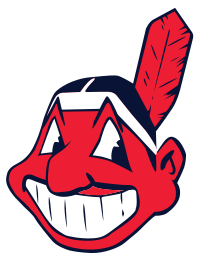 To me, Chief Wahoo, the crude, racist caricature representing the team, is a symbol of great beauty and worth. In years past, when people argued over it, I would conjure up a similar leering Chief Yahoo face, only with a beard and earlocks and a fur hat. Rabbi Wahoo or, I suppose, Rabbi Vahoo. Say he was the symbol of another team -- the Brooklyn Hassids. I would love that. I would have a felt Sluggin' Brooklyn Hassids pennant on my wall, no question asked. That was the logic that, in my mind, trumped arguments against him -- if you put my people under similar treatment, I would think it was okay. Ergo Chief Wahoo is okay. Yet others conjured up that same theoretical Jewish Wahoo figure in an attempt to prove the opposite. Imagine a team, The New York Jews, they say, assuming the argument was settled, assuming, for us, that we'd hate that, ignorant that, no, of course, many, maybe most, Jews would LOVE that, because it goes against every stereotype of their people. Just as individuals are different, groups are different. Italians cringe at gangster images of themselves, because it feeds into a strong negative stereotypes. But Jews often celebrate our gangsters, their 1930s boxers, in the guise of history, because it goes contrary to the Jew-as-weakling stereotype. The only thing my father ever told me about his religion growing up was that the rabbi from his synagogue was the guy who walked Lepke Buchalter to the electric chair. Native-Americans have the whole athleticism vibe down already, thank you very much. No need for them to catch a contact high of physical grace off sports teams, like everybody else. Just as, not being black, Fox News team of four white analysts might not be the ideal person to judge the value of a black Santa, so here, I'm not the marginalized member of some betrayed and slaughtered Native American tribe. If I were, I could see how these symbols would rankle, to see Chief Wahoo or, worse, the Redskins. Sure, fighting them is symbolic. But what other victory are they going to have at this point? For years, Cleveland has been nudging Wahoo into the shadows, and this year he is almost completely gone from their helmets and materials. And I thought ... okay. Not quite "good." I did, as I said, grow up with him. But I did grow up. And if the Cleveland Indians have decided to dial him back, so be it. We'll love the next mascot too. People in Chicago picketed Marshall Field's after its name was changed to Macy's. As much as I agreed with the idea, they were idiots. To live in this world, and get exercised over that issue, to have Frango mints drive you into the street with a sign. It's almost perverse. What they forget, what the anti-change crowd forgets, is the lesson the Fox people are breaking their teeth on. Old symbols go away all the time. We create new old favorites. The key question is: who controls these images? Not so much sports mascots, they're exceptions, created and literally owned by specific teams. They change them when it's good business to change them, or cave in to make the hassle stop. But cultural images. Who says what race Santa is? What Jesus looks like? And the obvious answer is, we all do. It is a collective decision, made by millions of tiny choices. That's what makes the Fox complaint, at heart, so cowardly and weak and foolish. They are in a competition, of sorts—what is the image of our cultural icons? They fear they are losing, because the minorities they scorn are both growing in numbers and boldness (though not racing to change Santa. That was just a blog post). Still, rather than play — run "The Miracle on 34th Street"over and over if it's such an urgent issue; they're a goddamn TV network; they could do it—they whine and cry and complain. It isn't the "Happy holidays" crowd that is spoiling Christmas; it's Fox News. 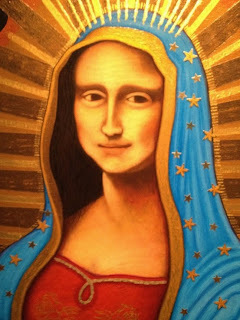 When I saw Cesar Augusto Martinez's "Mona Lupe," pictured above, at the National Museum of Mexican Art, I was delighted. It's beautiful, and whimsical, and everyone else has had a crack at parodying the Mona Lisa, so why not? I think I like it better than the original. If you have your head on straight, you are not threatened by someone riffing on your cultural icons, a black Jesus, a blues classic being covered by a white singer. Because they're not yours, not really. They're everybody's. That should be clear. But a lot of people don't have their heads on straight, and this kind of thing flushes them out of the woodwork. Probably a good thing -- it reminds us they're there and what they really think, and it probably makes them take a baby step toward understanding the diverse world they actually live in, even if they don't know it. Car parked on my parents' block in Boulder. People fall in love with Colorado. They take one look at those craggy mountains, that clean air (except for Denver, which is Cleveland with mountains) partake of the vigorous lifestyle, sample the way-left-of-center politics, at least in Boulder, and never return to wherever home happens to be. I am not one of those people. Even though — and very few of my acquaintances know this about me —I first visited Colorado 40 years ago, and have gone back frequently ever since, and lived there, oh, the better part of a year, all total, if you add up various summers and sojourns and visits. My parents live there still. 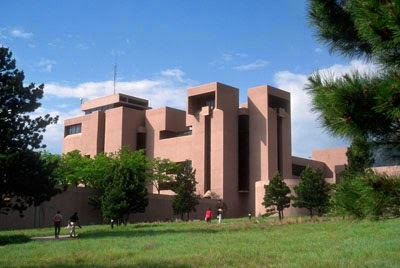 It began in 1973, when my father, a government physicist, started spending summers working at NCAR, the National Center for Atmospheric Research. We all came along. If you've ever watched Woody Allen's "Sleeper," you caught a glimpse of NCAR--I haven't seen the movie in decades, but somehow, the scene where the nose gets flattened by the steamroller comes to mind. We'd rent the house of a professor who was somewhere else, and I'd wander Boulder, not doing much of anything I didn't do back in Ohio — reading, riding my bike. I must have done some outdoorsy Colorado things -- I do remember climbing the Arapahoe Glacier. In 1987, my father retired from NASA in Cleveland, and they moved full time to Colorado-- but by then I was working at the Sun-Times, and dating Edie, and to be honest, never felt the pull as much as other people have. The mountains are nice, but Colorado struck me as being for the mountain-addled. You could hang out in Boulder and enjoy a sort of full-time Scoutmaster existence, gobbling handfuls of gorp and identifying spoor. Or you could live in Chicago and be an adult and accomplish things beyond learning Tai Chi. It helped they didn't want me. Boulder had a newspaper, the Boulder Daily Camera, and I clearly remember interviewing . The editor who talked to me said, in essence, "Our janitor has a degree from Harvard, and is mopping the floor, just waiting for his break here. Why should we hire you?" They didn't quite grab me by the collar and the back of the belt and heave me out the door, but the result was the same. It was an interesting place. Lots of Volvos. I had my 1963 P1800 for a while, and remember, at one intersection in downtown Boulder, that there were three other P1800s at a four-way intersection.That probably couldn't happen any other place outside of Sweden. The University of Colorado named its student union snack shop the Alferd [sic] Packer Restaurant and Grill, after a notorious Colorado cannibal who devoured his traveling companions on terrible snowbound winter. That always struck me as clever. So I have a fondness for Boulder, for its restaurants, and quirky shops like the Artists' Co-Op, the Pearl Street Mall and all that nature. I even ... and nobody knows this ... sometimes ski. I'm putting on my Colorado uniform -- Keen hiking boots, rag-wool socks, REI fleece—and heading there Tuesday, with Kent in tow, and will try to file a report or two from the People's Republic of Boulder. I'll try to find the right Colorado-bound reading material for the flight, but it'll be hard to top the year I brought along, Bear Attacks: Their Causes and Avoidance by Stephen Herrero. "Unflinching" the book's inside flap says of its exhaustive, graphic account of every bear mauling on record. Which is not a claim that the reader can echo.